Saving Jewish souls from cults and extreme assimilation is terribly stressful work. The United Nations, European Union and all Those Faux Humanitarian NGO’s are Guilty‏! Where has all the billions of Euros and dollars that have been poured into Gaza over the years gone? Why Is One of the Strongest Western Economies Feeling So Vulnerable? Those predictions are very dangerous and can cause more economic problems than our going our own way would have. US official interference in Israel's Elections is not only immoral but may be illegal under US law. The pope's "even-handedness" was an affront by equating the State of Israel with that band of Arab terrorists. Wednesday evening 25th of February there's just the event for Anglos to attend, The Anglo Vote! When Israel's Left cries that Israel's mission is to be a secular democracy, they're wrong or lying. There's the "hype" that politician "a" or "b" can make it all better. None of it's true. Peace, true peace, isn't up to us. We've offered it on gilded platters forever. Nothing we do will bring peace to our Land. Regardless of what your succah is made of, have a wonderful and joyful Succot! We'll never be able to negotiate a true, lasting peace with the Arabs.Their aim is our destruction. Judaism isn't a part-time religion. Every aspect of life has a Jewish connection. Prime Minister Binyamin Netanyahu should be using this opportunity to totally close off all negotiations and tell the world the truth. In Israel, many of us mistakenly think that world Jewry and international politicians have nothing else on their minds but what's happening in Israel. The opposite is the case. 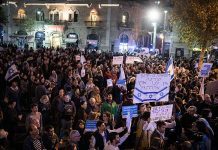 I am extremely unhappy with the so-called "anti-corruption" demonstrations going on here in Israel. They are to force the hand of the already Left wing judiciary and the police. Who is the Real Naftali Bennett? Now, the NRP is getting nervous. They should have looked more carefully before signing the Ketuba, marriage contract with Bennett. Everything Dov Indig, killed in action during the Yom Kippur War, said about the secular kibbutz movement has happened. The State of Israel shouldn't beg anyone for peace. One wonders if Pres. Obama knows the phrase "Truth, Justice and The American Way"? Senegal sees no issue in taking our aid and then supporting an anti-Israel resolution, one-sided, unfair, completely out of proportion to what Palestinians are doing. Undoubtedly, once he's "former president Obama" he'll join anti-Israel Jimmy Carter against Israel. Shiloh Musings: Has Labor’s Herzog Suddenly Gotten Smart? Did you notice that Herzog said unilateral withdrawals are dangerous?! Maybe he is catching on!